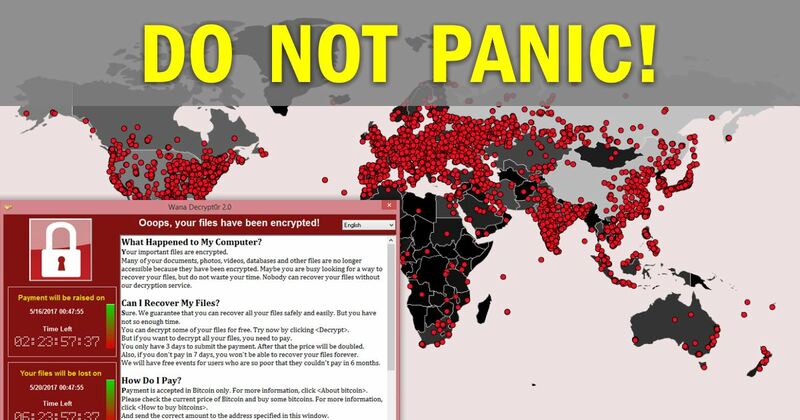 WannaCry is believed to use the ETERNALBLUE exploit, which was allegedly developed by the U.S. National Security Agency, to attack computers running Microsoft Windows operating systems. ETERNALBLUE exploits vulnerability MS17-010 in some versions of Microsoft’s implementation of the SMB server protocol. A patch to remove that vulnerability had been issued on March 14, 2017, but the delay in applying updates has left some users and organisations vulnerable. Dear God, how do I protect myself? Well, as noted above, you’re already protected if you regularly apply Windows updates! Microsoft released a patch to plug the security hole 2 months ago. So, if you have automatic updates enabled, and your system is kept up to date, the hole has been plugged. Naturally, you should also avoid opening strange file attachments and such, but you should do that normally, anyway. Dear GOD, I turned off Automatic Updates! What do I need to do?! First, turn auto updates back on, and keep it on. Note that Windows 10 1607 is the previous “version” of Windows 10. If you’ve recently updated to the “Creators Update”, your Win 10 is already patched. I also recommend buying Malwarebytes. Yeah, it costs money, but it’s excellent protection against malware. It also includes ransomware protection built-in! Can’t beat that. Right, so… Many institutions are getting hammered by this ransomware because their systems aren’t patched. But if you’re a normal home user, it’s very likely your puter was patched 2 months ago. Any comments why Russia has been hit the hardest with this Scottie? I dunno. My first guess would be because it’s an NSA-discovered flaw. It’s interesting that the UK keeps saying, “Oh, we don’t know how this happened…” while the rest of the world is going, “Well, duh! Somebody’s used the NSA’s flaw! I wonder who it could be? !” But of course GB would never dare to say anything that might be interpreted as against the USA. On the other hand, from what I know, Russia is moving away from Windows and to their own Windows-like flavor of linux. So… ??? Thanks for the info! In terms of using Malwarebytes, can it be used in along side Kaspersky protection (I use this)? I don’t have much computers knowledge (but learning), but I think I’ve been told or read that you don’t want to run/have installed two anti-virus programs on the same computer. I think the Malwarebytes people claim Kaspersky will work along side MWB, but I’ve never tried it. Kaspersky is generally quite good – at least historically. I usually recommend Malwarebytes in addition to Windows Defender, and that’s it. But if you’ve got Kaspersky, you’re prolly pretty safe!! Having said all that, if you do get malware (including ransomware), Malwarebytes’ download-and-scan option is my #1 goto app for removing evil stuff. I have successfully used it to remove ransomware on a puter years ago, which is part of what convinced me that MWB is pretty awesome. Thanks for the response. Hopefully I won’t ever need Malwarebytes! As ever, sensible dependable information. Ok so I get Mailwarebytes is is good. I use the free version and have windows updates switched on. Shall buy the full version. And I use MSSE. So is there protection for against opening attachments from someone you dont know? Reason I ask is. In 2012 I made the classic mistake. Opened one! It casused reboots reboots reboots reboots…. etc etc…frantic searches for a fix. Don’t whether the tried fixes or attachment(opened) caused the real problem. The windows firewall got destroyed. A couple of months later I wiped the computer and reinstalled. This happened due to, Stupid Curiosity and beig tired! MSSE and Malwarebytes should both scan e-mail attachments when they’re opened. But I don’t think MSSE will catch all the stuff that MWB will. Just make sure “Real-time Protection” is enabled in MWB, and you should be okay.